DAC: Dedicated Administrator Connection feature is available from the SQL Server 2005. It is available in all the higher editions by default except express edition. DAC will be useful when SQL Server is not responding any connections; in such kind of situation DBA will connect through the DAC and troubleshoot/fix the issue. You can execute below kind of command for the initial troubleshooting. DAC is disabled by default, it is a good practice to enable the DAC. You can enable the DAC using by executing below query. You can connect using DAC on of the following method. Using Command Prompt: Use SQLCMD utility to connect to SQL Server as below. -A argument is to specify the DAC connection. -S argument is to specify the server name. -d argument is to specify the database name. Using Management Studio: Write ADMIN: before the server name in management studio connection window. It will give you the DAC connection. To enable the DAC connection in SQL Server express edition add ;-T7806 trace flag as startup parameter. Go into configuration manager — right click on SQL Server Service and select properties — go into advanced tab and add the trace flag ;-T7806. 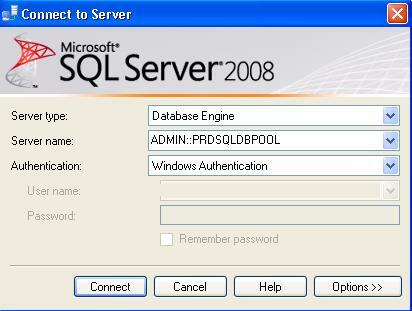 Once done restart the SQL Server Services. This entry was posted in SQL Scripts, SQL Server, SQL Server 2008, SQL Server 2008 R2 and tagged Database, Dedicated Administrator Connection, FAQs Help and Tutorials, Microsoft, Microsoft SQL Server, Select (SQL), SQL, SQL Server Express, SQL Server Management Studio on November 18, 2011 by Jugal Shah.